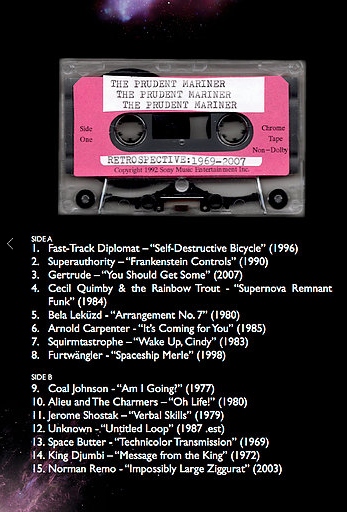 Cassette Gods: THE PRUDENT MARINER "Retrospective 1969-2007"
I made contact with this mysterious album in the form of a typewritten letter, a hand collaged cassette and a large glossy book. It appears to be a compilation of tapes found in thrift stores...you know, the kind of stuff that mostly ends up in the garbage mound....the kind of music made by people with a devotion to a dream. I read the book listened to the tape, did some research and had a fun time doing all of it. Maybe the less I say the better. At first I didn't know if this was a hoax or not and I'll leave it up to you to decide. As for now, I remain an oblivious fool. The Prudent Mariner appears to be a multimedia production company with their hands in numerous pies. You can get a taste of this gumbo on the website for free. Click on "Retrospective 1969-2007" to check out the tape and the book. Cheaper than dinner and a movie.